You may be under the impression that cargo shorts are widely condemned in this day and age — and it’s true that the preferred summerwear of every suburban white boy circa 1997 has its critics. To judge by the internet, however, the style has roughly 10 times as many defenders as detractors. Each year, multiple media outlets allow some unashamed manchild to argue for the comfort, utility and humble workmanlike appeal of this allegedly reviled garment. I, for one, am starting to wonder if the haters exist at all. But the many odes to cargo shorts aren’t created equal; some may do more damage to the legacy of cargo shorts than do the takedowns. Therefore, it falls to me to rank them. The seething sexism of this trainwreck is evident from its very first words: “I think we all know that there is nothing more sickening in this day and age than female privilege.” Oooookaaaayyyy. According to Bunch, hectoring “harpies” are cruelly preventing their husbands from enjoying the benefits of cargo shorts, while the “elitist East Coast establishment sneers at it with their dying gasp.” I don’t know how this guy thinks pronouns are supposed to work, but I do know that I wouldn’t ruin a perfectly good red baseball cap by slapping the phrase “America will be made great again” on it. Playing pretty fast and loose with SEO, this post barely deigns to consider cargo shorts, let alone fight for their honor. Instead, it’s a paragraph meant to assure us that cargs can now be found in “higher-end stores,” as if all we were worried about was spending too little money on them. Following this are links to three such pairs of supposedly superior shorts, each priced between $50 and $70. The whole effort reeks of sponsored content. First of all, cool it with the headline. Wars are fought between countries, or in certain rare cases, between man and ape. That Edwards also stages the cargo short debate as a battle between the sexes — “Women are trying to take our cargo shorts away,” he writes — is both offensive to pro-cargo-short women and erasure of fashionable gay men who wouldn’t be caught dead in them. But the killing note is a mention of his own favorite pair, which are “dark green denim faux military camouflage.” Yechhh. By the way, Business Insider had already taken an anti-cargo-shorts stance last year. Overall, this is sloppy, unfocused work. It reads a bit like a drunk guy trying to talk his way into a bar with a dress code, and, like Jim Edwards of Business Insider, Drezner indulges the tired canard that women and “misandry” are to blame for the culture of cargo-short backlash. Meanwhile, he includes a rather pervy aside on yoga pants. The silver linings here are the link out to an actual doctoral thesis on cargo shorts and the fact that Drezner signs off with this absurd kicker: “Any article of clothing that helped defeat Hitler is an article of clothing that should never go out of style.” There is no other mention of Hitler, World War II, the U.S. military or combat gear in the entire piece. Among the oldest defenses of cargo shorts I turned up, and it shows. David is a buddy of mine, at least online, and I have a hunch that even he would now wince at the references to lynch mobs and Kristallnacht here. A frat-guy breed of offensive hyperbole is standard for BroBible’s archive, but it really undermines the critique of people who think they’re cool for dressing themselves according to Mad Men. I respect the shoutout to stealthy stoners, though: “What happens when you need to smuggle a bowl and an eighth into a concert? […] Team cargo shorts over here put his weed and his lighter and his bubbler into his cargo shorts cargo pocket and walked into the concert just fine.” The horror of standing through a Phish set while totally sober should not be lost on us. I would ding this college-dude entry for contending that non-cargo shorts are “emasculating” — and for overstating the emotional stakes in this fight — but as the essay rolls on, it becomes clear that Orman is ironically self-aware: He exclaims that cargo pockets are “big enough to hold at least 2 beers on each leg, and still have room for my phone, chain wallet, vape and condoms for all the action I’m going to score rocking these cargo shorts!” Nice. I also have to commend him for his wordplay (an “assortment” of shorts becomes an “ashortment”) and the splendidly screwball assertion that Charles Darwin, were he alive today, would rock a pair of cargos. Hell of an image right there. The only problem is, since the essay is satire, it’s technically mocking cargo shorts — not defending them. 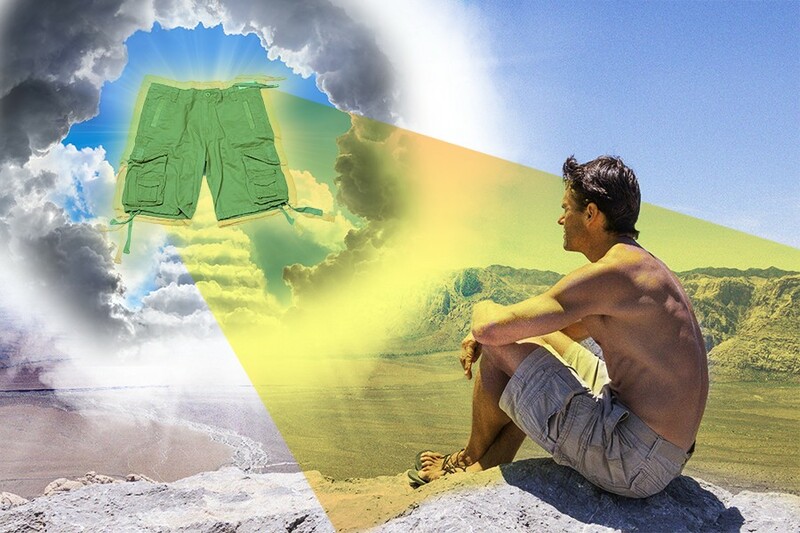 BroBible’s second run at cargo-short solidarity is a workmanlike success, touting many of the familiar advantages, from comfort to cost-effectiveness. It’s also unique in associating cargo shorts with virility — by reminding us that men who wear boxers have harder erections and more sperm. But I don’t really buy the idea that boxers are incompatible with preppy above-the-knee shorts. I’m also not terribly enthused by Williamson’s tacit approval of the Vietnam War, nor the body-shame vibes when he addresses how effectively cargo shorts hide men’s beer guts and upper legs. (But not everyone can be an exhibitionist like me, and that’s probably for the best.) In the end, this laundry list of pros should be more than enough to drown out all the cons. A notable early example of the genre, Joiner’s take is courageous for the simple reason that it appeared in Esquire’s snootily white-collar style section. Sadly, for that same reason, it’s too apologetic, and we’re warned not to wear cargo shorts to work or the club, which is kind of like quelling the revolution before it starts. Nevertheless, credit where it’s due: Joiner first establishes that cargo shorts are immune to trend cycles, then praises their physical durability, and finally offers the romantic claim that their rips and stains tell a story. “There’s not a bespoke suit in the world that can serve as such a totem to a life lived, chronicle your existence so intimately with its own.” Amen, sir. Richards looks pretty damn hot in his cargo shorts, proving that a camo pattern can be pulled off after all — apologies, Jim Edwards of Business Insider. But it’s the case he makes for cargos as a parent’s best friend, full of roomy pockets that store anything your kids might need at a moment’s notice, that really carries this column: “If they want something, it’s already attached to us like magic,” he writes. “Trust me, Batman would be more efficient if he ditched his ridiculous utility belt and rocked some cargo shorts instead.” Who isn’t charmed by this? Let the wonderful father wear whatever he wants. Two years after his groundbreaking Esquire essay, Joiner proved himself the master of the cargo shorts defense with this nuanced and informative follow-up. Zooming out to a bird’s-eye view, he acknowledges the cyclical nature of these takes, finally realizing that they have less to do with what we wear than who we are. “Cargo shorts are a leisure item,” he writes, and “not everyone’s life is the beginning of a Jimmy Buffet song.” For a Cape Codder like himself, cargo shorts hold an obvious allure, yet he’s learned to shed any self-righteousness regarding the cultural divide that separates his world from Fifth Avenue fashions. If cargo shorts are to gain the respect they deserve, their owners must know where and when to wear them. As if this soul-searching weren’t enough, Joiner then points us toward examples of cargs that’ll help you fit in on your Martha’s Vineyard vacation. Game, set, shorts.